Hooked On The American Dream: UK Daily Mail-"Bozo" Tancredo; "Obama Is Worse Than Al-Qaeda"
UK Daily Mail-"Bozo" Tancredo; "Obama Is Worse Than Al-Qaeda"
President Barack Obama is a bigger threat to the United States than Al Qaeda or terrorism, Colorado gubernatorial candidate Tom Tancredo has claimed. The former Congressman made the comments while campaigning in Canon City Tuesday. 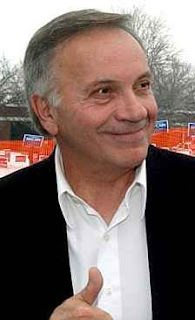 Tancredo has a reputation for controversial comments, including a suggestion that the United States bomb Islam's holy sites if attacked by nuclear weapons. The former Republican congressman is running on the American Constitution Party ticket. Tom Tancredo is quick to admit he brings plenty of baggage to the Colorado governor's race. During President George W Bush's administration, he got thrown out of the White House for suggesting Bush was soft on illegal immigration. And he once refused to take part in a presidential debate because it was on a Spanish-language network. So, Obama is worse than Al-Qaeda. This assessment comes from a grown man whose nick name is Bozo. Which happens to be the name of a clown. Now, I am usually pretty open minded but in this case,I find it difficult to take this man seriously. The Tea Party is one of the most anti-American political organizations currently operating out in the open. I find that their agenda is designed to roll the nation back to a place where everyone except them, has no rights whatsoever. This statement is just one of many that they have used to continue the anti-Muslim, anti-Black sentiment that they have stirred up.